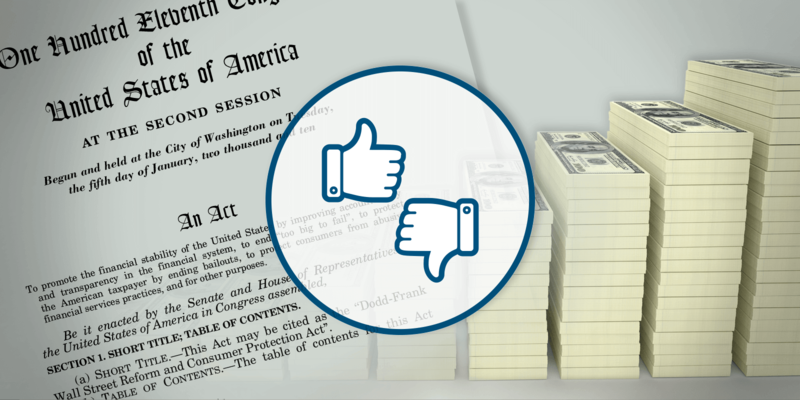 In response to the 2008 financial crisis, U.S. legislation was passed in the form of the Dodd-Frank Act to bring some changes in the corporate environment. Say on Pay, which gives shareholders the right to vote on the remuneration of executives, addressed the issue of excessive CEO pay and was meant to give shareholders a voice and reduce CEO pay to a reasonable level. Say on Pay has been in effect for almost eight years, but the question of how long it takes for Say on Pay votes to exert a noticeable impact on CEO pay is difficult to address. Intuitively, it seems possible that CEO pay should decrease since it is under the scrutiny of a large number of shareholders. However, the data reveals a different story. CEO pay, instead of declining, actually experienced a small degree of growth after Say on Pay was put into law. This Equilar study focuses on CEO total compensation data among Equilar 500 companies in order to reach a conclusion. 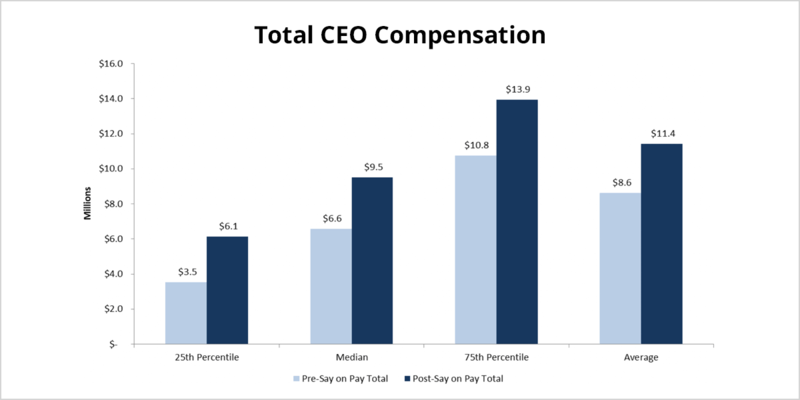 The median CEO compensation after the initiation of Say on Pay was $9.5 million, while the median pay before Say on Pay was signed into law was $6.6 million. The economy has been strong after the financial crisis, and the 43.9% increase in median CEO pay around the enactment of Say on Pay reflects that. Moreover, both the 25th and 75th percentile figures rose over that same time frame, at 74.3% and 32.6%, respectively. It appears that CEO compensation in the 25th percentile grew the fastest among three groups—a trend that may be attributed to the fact that companies are seeking to align with general industry pay trends. Since Say on Pay is merely an advisory vote and does not have a direct influence on executive compensation, in general, trends at companies that failed Say on Pay can help to determine the cause. Though it does make sense and is widely commonplace that companies revise executive pay structures and policy after a majority of shareholders do not agree with the current executive compensation strategy, there are exceptions. The average CEO total compensation at companies that failed Say on Pay decreased significantly from 2011 to 2017, a total of 44.9% over that time frame. It seems as if Say on Pay did not have quite a major influence on the pay amounts in the early stages, but did after companies settled into the routine. 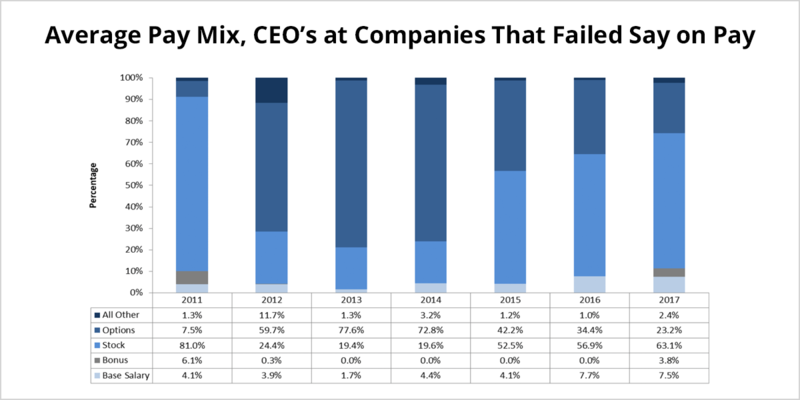 Regardless, breaking down the average pay mix of companies that failed Say on Pay depicts a trend that could be a major player in a failed vote: options. According to the 2018 Equilar CEO Pay Trends report, options made up an average of 11.8% of CEO pay mix in 2017. However, of the companies that failed Say on Pay in 2017, options made up 23.2% of pay mix, almost double the amount. Over time, compensation professionals realize the power of Say on Pay and take appropriate actions. Diving into the details on a per-company basis allows for a highlight of an example among companies that have failed Say on Pay proposals. Bed, Bath and Beyond (BBBY) is particularly illustrative of the trend in CEO compensation. After its first time failing Say on Pay in 2014, rather than reducing CEO Steven Temares’ pay, BBBY increased the option and stock awards granted to Temares. Perhaps not surprisingly, after this increase in options and stock, BBBY then failed its Say on Pay vote in 2015. As a result, option award values decreased by 52.4% in 2016 and then were decreased by about $850,000 the following year. Though the company failed Say on Pay in both 2016 and 2017, the total compensation of the chief executive decreased by 20.9% from 2014 to 2017. This shows that the company made a concerted effort to gain approval in the eyes of its shareholders. Additionally, it seems as if companies that fail Say on Pay consecutively make a greater point of altering their CEO pay plans, especially when it comes to options. Despite the provisions of Say on Pay and the ability of shareholders to express opinions on the executive compensation of a company, CEO pay has continued to rise. However, recent trends have shown that pay mix is moving towards the norm at companies that have failed Say on Pay, especially when it comes to options. Additionally, if a company fails Say on Pay multiple times, these failures seem to have a moderating effect over time, as shown in the case of Bed, Bath and Beyond. While Say on Pay votes may not have a direct influence, the continuity of attention by shareholders and proxy advisors over the executive pay issue is an increasingly significant feature of the corporate governance and executive compensation landscape, and will likely continue to be so. Equilar offers data and solutions to assist companies in ensuring that their executive pay packages meet the standards of investors. 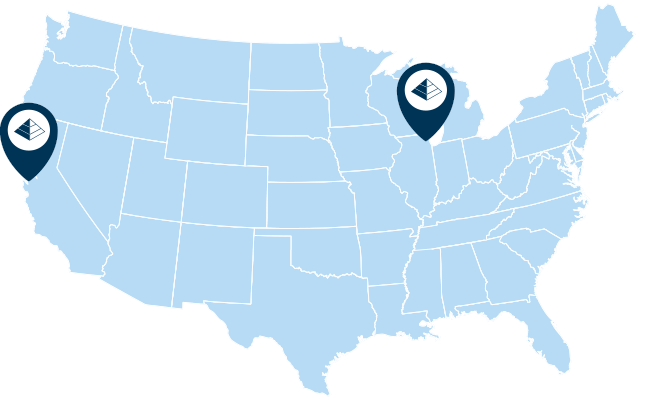 The Equilar product suite includes executive compensation benchmarking tools, pay for performance alignment solutions, a Say on Pay Tracker, Investor Voting Results and much more. Visit https://www.equilar.com/shareholder-engagement.html to learn more. 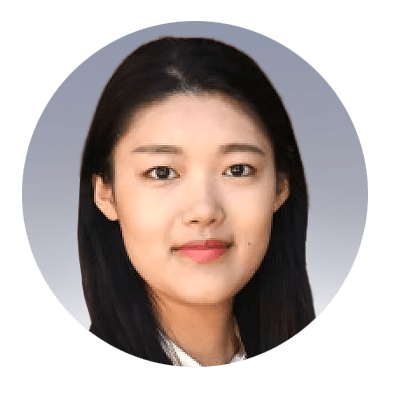 Ran Bi, Research Analyst at Equilar, authored this post. Please contact Amit Batish, Content Manager, at abatish@equilar.com for more information on Equilar research and data analysis.